Actaeon was the son of Autonoe, who's family was already generally cursed to be miserable. Which just sucked. But Actaeon grew up pretty decently. He was a Greek prince and a hunter taught his skills and wisdom by the "good centaur" Cheiron (who was like the wisest guy ever) and so you'd think he'd be pretty smart. He was definitely a follower of Artemis, being the hunter he was, and not a bad guy. 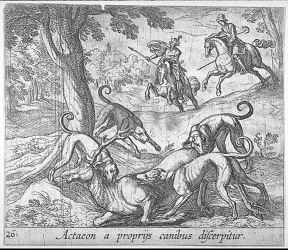 Well Actaeon was wandering around one day with his pack of hounds and happened to get deeper into the woods than he'd originally planned. This wouldn't normally have been so bad, except that on that particular day at that particular hour, Artemis had been hunting there as well. After a hard hunt, she had decided to take a nice leisurely bath and was lowering herself into the water just as Actaeon came around the bend in chase of his dogs. He saw the goddess, naked, bathing in the pool. That right there should have told him, "GET OUT BEFORE SHE SEES YOU, MORON!" but poor Actaeon had been born without these essential instincts, and now that they were needed he was left high and dry. So Actaeon stayed. He stared. His jaw was just hanging - how many naked virgin goddesses (in excellent shape) does a man see in a lifetime? Well, usually it's only one, because if they catch you they generally kill you. 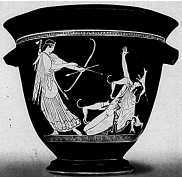 Which is exactly what Artemis did to Actaeon. When the goddess realized that Actaeon was there (he couldn't have been too hard to miss) she was furious. How dare he, a mortal man, just STAND there and watch her. The impudence and impiety of it enraged her. Artemis reached for the first weapon she could find - as her bow was too far to reach easily, and she had the benfit of magic, it was the water of the pool that flew from her fingertips. As the drops touched Actaeon, the young man was transformed into a stag. The cold Artemis whistled and Actaeon's own hounds answered the call pursuing their master and tearing him to pieces as he tried in vain to call out to them.